Spartans are looking to close thier high school careers on a high note. The Sacred Heart girls soccer team has a saying — “Last one, best one” — and it’s exactly how the senior class is looking to close its high school tenure. Whether it’s running sprints in a fitness test, chasing a ball down, or closing out the final minutes of a game, the Spartans are competing against themselves and trying to improve on what they’ve done in the past. And with a group of five four-year starting senior players, along with senior Tori Minda, who started two seasons before playing for the U.S. Developmental Academy and unable to play high school soccer as a junior, the girls are looking for their last season of high school soccer to be their best one. During the freshmen seasons of Minda, Caitlin Kennedy, Caroline McDermott, Sara Micheli, and the Biscardi twins, the Spartans had a.500 record. But the turnaround didn’t take long, as Sacred Heart won the state CHSAA title as sophomores. After losing to eventual state champion St. Anthony’s in last season’s league final, the Spartans are looking to return to the top. The Spartans (2-0) appeared in midseason form Wednesday, with two goals each from Kennedy and Kaelan Bradley with Minda adding two assists. The backline of Claire Carney, Lauren Wasserman, Theresa Cash and Melissa Biscardi had a strong game, with Micheli totaling nine saves. 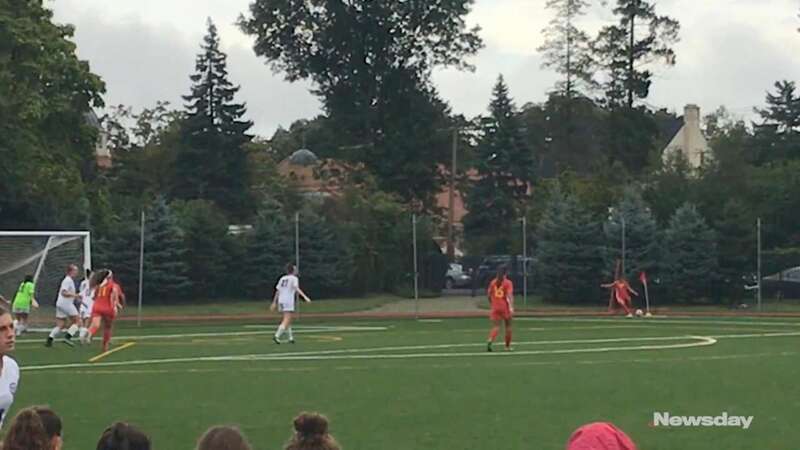 Juliana Santel scored off an assist from Erin Studdert for Garden City (1-2). And with one last season for what Sacred Heart coach Peter Bralower dubbed “The Golden Class,” he knows it’s going to be a hard group to replace. Garden City vs. Sacred Heart girls soccerSacred Heart defeated host Garden City, 4-1, in a Nassau non-league girls soccer match Wednesday.